A Home Remodeling Company Specializing in Kitchens, Baths, Finished Basements, Additions, Custom Shelving, Commercial Interiors, and More. You can have the home of your dreams with construction services from our team. Welkin Construction Company in Howell, Michigan, provides residential services that make your home more valuable, unique, and appealing. Our new company provides high-quality home improvement and construction services with prompt and friendly contractors. We use our 15 years of experience, quality services, and effective communication to meet and exceed your expectations. Hire us today for a more personalized living space tomorrow. If you're a business owner, we can make your commercial property more appealing to employees and customers. Ask us for more information about our commercial interior work. 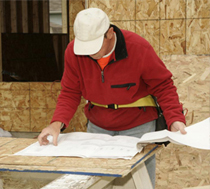 Request a quote from our construction company today.